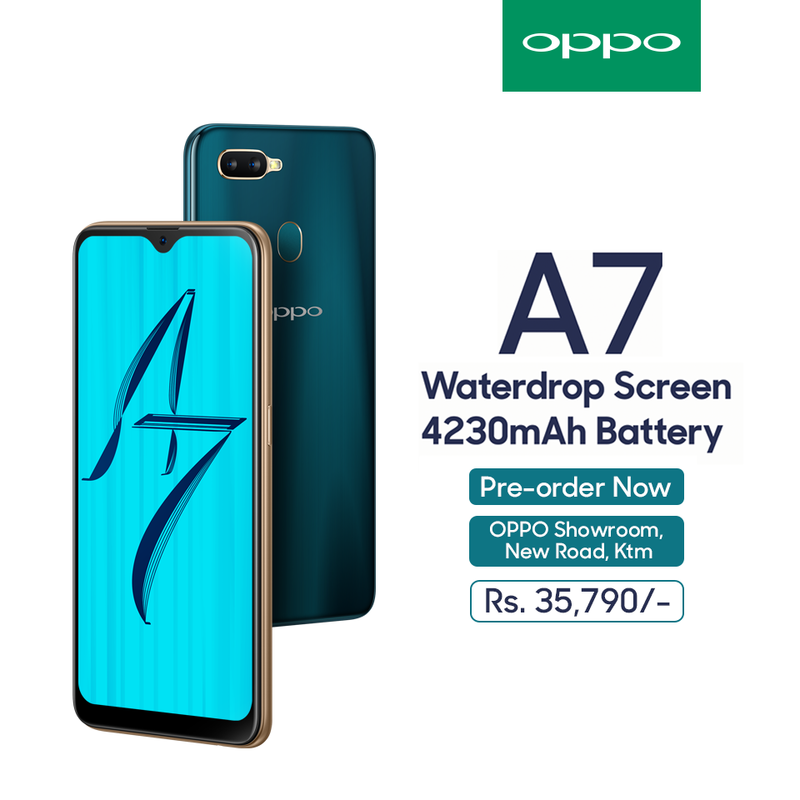 Kathmandu, 6th November 2018: OPPO, the selfie expert and leader is all set to launch its new product under "A series" of smartphones in Nepal, the "A7". As per the company information, OPPO A7 will be with Powerful battery and premium design and it will be introduced under affordable pricing for Nepali consumers on the auspicious occasion of Tihar festival. OPPO has announced the opening of its pre-order for interested consumers from Nov-6th till Nov-14th. The first sales event for the phone is scheduled to be held on 15th November through its official showroom at Pako, Newroad. During the Pre-order period, interested consumers can book their set of phone/s by visiting OPPO's official showroom at Pako, Newroad. For Booking the phone consumers will have to pay Rs. 2000 as advance payment. The pre-bookers will get a golden opportunity to meet and greet Star sensation of Nepali Film industry, Actress Swastima Khadka and get the autographed phone handed over by herself. The star will be present at OPPO's official showroom during the First sales event for certain hours to meet and greet OPPO Fans. The heartthrob of millions of youths, the star, Actress Swastima Khadka has recently been officially appointed as "OPPO Friend" for Nepal. The Star now could be seen endorsing OPPO Products and will be promoting OPPO phones. As a global brand, OPPO always tends to adopt the local trend and collaborating with local stars is one of them. The brand is really eager for further collaboration as such in near future as well. Talking about the Collaboration CEO OPPO Nepal, Mr. Bobby Zhao said "We are really happy to be collaborating with heartthrob of millions of Youths here in Nepal, Actress Swastima Khadka. We believe such collaborations with local stars will help us convey our messages to youths in more effective way. We have taken this opportunity as a step further towards localization. We hope our fans would really love and appreciate our effort of localizing the product with help of local collaborations."